Eliminate bad bacteria with External Probiotics for deep Spring Cleaning: P2 i Clean Everything All-in-1 Surface cleaner concentrate cleans EVERYTHING! 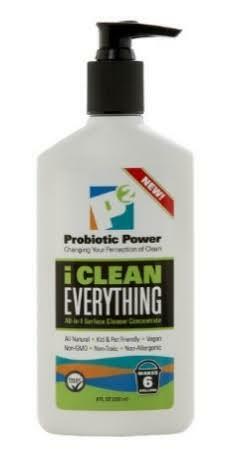 Eliminate bad bacteria with External Probiotics for deep Spring Cleaning P2 i Clean Everything All-in-1 Surface cleaner concentrate cleans EVERYTHING! Spring is almost here and that means time for Spring Cleaning! The P2 i Clean Everything All-in-1 Surface cleaner concentrate will make your task of cleaning much easier! I like that it really does seem to clean everything! I tried it on glass, tile and even wood and was impressed that it cleaned all these different surfaces. I also like that it is Non-toxic and safe for homes where pets and children live. I highly recommend! 100% natural probiotics, Biodegradable, Non-toxic, Non-flammable, Non-allergenic, Non-GMO, Vegan, Gluten free, Not tested on animals, Safe for children and pets, No harsh chemicals. Hospital Tested.